It has been open less than a year but diners have taken notice of Rossetti Restaurant, voting it one of the top 100 neighborhood gems in the country. “I was kind of shocked,” said Chris Rossetti, who owns the Sutton Street restaurant along with his father, Bob Rossetti, and uncle, Stephen Rossetti. In fact, all the Rossettis said they were downright skeptical when they received an email notifying them of the award. Chris Rossetti said he wondered if he had to pay for the honor. 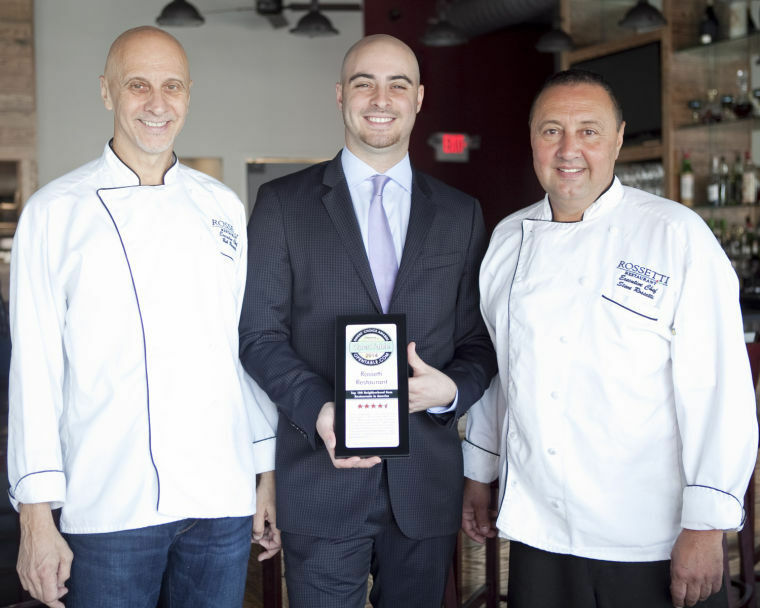 From left, Bob Rossetti, Chris Rossetti and Steve Rossetti with their OpenTable Diner’s Choice Award, at their Rossetti Restaurant on Sutton Street in Lynn. Bob Rossetti agreed the award came out of the blue and like his son he was leery. Initially they told no one about the award because they were not convinced it was legitimate. It seemed a little unbelievable that they should win such an honor when the restaurant has been open less than a year, he said. But Chris Rossetti said he contacted OpenTable, which is an online/mobile restaurant locator and booking agent, which also provides restaurant reviews, and it confirmed the award. Now the narrow plaque proclaiming Rossetti an official neighborhood gem sits on the bar until they can find the perfect spot to hang it, Chris Rossetti pointed out. The Top 100 Neighborhood Gems list is voted by OpenTable diners, which Chris Rossetti said makes the honor all the more special. According to the OpenTable website, the list is determined by analyzing more than five million reviews of nearly 19,000 restaurants across the country, each submitted by a verified diner. “Only three are in Massachusetts and we’re one,” said Chris Rossetti. The award shouldn’t be too shocking to anyone who knows the Rossetti family. Dressed in jeans and a chef’s coat Bob Rossetti said they have been in the business for 30 years. Bob Rossetti said the stars aligned when he found the Lynn location for his second restaurant and now the critics’ stars seem to be aligning as well. For a full list of restaurants, in alphabetical order, on OpenTable’s neighborhood gem list check out www.opentable.com/m/best-neighborhood-gem-restaurants-in-america/. Chris Stevens can be reached at cstevens@itemlive.com.